Living systems owe their survival and health to a series of complex biochemical pathways of maintenance and repair. These defense systems create the homeodynamic space of an individual, which is characterized by stress tolerance, molecular damage control and continuous remodeling. Ageing, age-related diseases and eventual death are the consequences of a progressive shrinkage of the homeodynamic space, due to the failure of maintenance and repair. Whereas longevity assurance genes do affect the essential lifespan of a species, there are no ageing-specific gerontogenes to cause ageing and to limit the lifespan of an individual. The challenge of preventing, managing or treating age-related chronic diseases and other health problems requires abandoning the traditional one-target, one-shot biomedical approach. Wholistic methods incorporating lifestyle-based hormetic interventions, including food, physical activity and mental engagement, appear to be potentially more successful in maintaining health and in extending healthspan and longevity. The discovery of cardiac stem cells (CSCs) able to renew the pool of cardiomyocyte raised the question of how these cells can be recognized and directed towards cardiac reconstruction after severe ischemic injury. The functional studies demonstrated that the differentiation of adult cardiac stem cells reproduce the stages observed in the embryonic development. Each stage is characterized by a complex molecular signature, which can be used for identification and molecular targeting. Three major markers have been used to isolate CSCs: c-kit, Sca-1, and Isl1 and different progenitor populations have been described: side-population (SP), cardiosphere-derived, epicardial-derived. Combinations between the main three markers and other transcription factors, cell surface proteins and regulatory RNAs may delimit even further the cardiac precursors. Accumulation of data leads to the idea that a single, yet unidentified unique cardiac stem cell is at the origin of those observed variants. In this review, we intended to summarize the actual knowledge about the main molecular markers of cardiac stem cells. Pancreatic cystic tumors (PCT) are relatively common findings in general population due to the widespread use of cross-sectional imaging. PCT can be benign, with premalignant potential or malignant, a different management being applied for each type: benign cysts are usually referred for follow-up (based on imaging), while premalignant or malignant lesions should be surgically resected. The aim of this review is to describe the latest imaging technique that could be used for PCT diagnosis and to establish its clinical impact. Endoscopic ultrasound (EUS) is generally used to evaluate a pancreatic mass and to identify its characteristics. It offers a good visualization of the lesion. When combined with fine needle aspiration and cystic fluid analysis, the diagnosis potential is increased, although its accuracy for differentiating benign and malign tumors remains modest. EUS-guided needle-based confocal laser endomicroscopy (nCLE) is a new imaging technique that uses a miniprobe thin enough to be passed through a 19G needle. It provides in vivo images of the pancreas at a cellular level, offering the possibility to assess any changes that might have occurred. Several studies have shown that nCLE is feasible to use for PCT evaluation, imaging criteria being established with 100% specificity for intraductal papillary mucinous neoplasms (IPMN) and serous cystadenoma (SCA). Regarding the safety, more studies are needed. EUS-guided nCLE appears to be a new imaging technique that provides encouraging results for differential diagnosis between mucinous/non-mucinous cysts. The Epstein-Barr virus (EBV) infection is an endemic disease, over 90% of the population being exposed to it by adulthood. EBV is implicated in the etiology of a significant number of neoplasms, which acquire particular features in terms of course and prognosis. Incidence rates are much higher in children. To establish the link between EBV and neoplasms, EBER (Epstein-Barr virus non-encoded RNAs) needs to be highlighted in tumor tissue. The role of EBV in patient response to oncological treatment remains controversial. Background: Tumor-associated macrophages play a significant role in tumor progression. CSF-1/CSF-1R is one of the most primary regulators of macrophage physiology in immune system. The expression of CSF-1/CSF-1R in nasopharyngeal carcinoma is unclear. Objectives: The aim of this study was to compare the expression of CSF-1R in nasopharyngeal carcinoma to nasopharyngitis for assessing the role CSF-1/CSF-1R in nasopharyngeal carcinoma. Materials and Methods: Diagnostic tissues from 56 nasopharyngeal carcinoma patients and 32 nasopharyngitis patients were evaluated retrospectively by immunohistochemical analysis for the expression of CSF-1R. Results: Significant differences of CSF-1R expression exists between nasopharyngeal carcinoma patients and nasopharyngitis patients (p<0.001). However, there is no relevance between CSF-1R and worse survival. The present study was designed in the context of the uncertain circumstances related to the best therapeutic option for ridge preservation. The research aimed to investigate the quality of early healing processes developed in the former sockets preserved with a collagen matrix alone or associated with a bone substitute in comparison with naturally-healed sockets, using an animal model previously validated. In both quadrants of the mandible of two dogs, the distal sockets of the second and fourth premolars served as experimental sites. Two sockets healed naturally, three sockets were preserved with the collagen matrix and three sockets were preserved with the collagen matrix plus a bone substitute. After one month of healing, the samples were harvested and histologically processed. The soft tissue covering the preserved ridges displayed an obviously thicker epithelial layer containing mostly areas of parakeratinized epithelium alternating with keratinized ones in comparison with naturally-healed sockets. In the apical third of the sockets, a mature bone structure was recorded for all three types of post-extraction approaches. While in naturally-healed and collagen matrix-preserved specimens the central third of the sockets contained bone with a mature aspect, in collagen matrix plus bone substitute-preserved sockets an immature appearance was observed. In the external third of the sockets, only in matrix-preserved alveoli a well-developed cancellous bone was present. The bovine bone substitute seemed to delay hard tissue development. The use of the collagen matrix could be a clinical option to preserve post-extraction ridges especially when an improvement in soft tissue quality is desired. Quantification of local ischemia and inflammatory response syndrome correlated with histological changes associated with ischemia-reperfusion injury (IRI) after revascularization techniques. We included 12 adult male Wistar rats, aged eight weeks that were randomly divided into two groups. The first group acted as the control and at the second group, we induced diabetes by intraperitoneal streptozotocin administration (60 mg/kg). After eight weeks, the rats were subject to ischemic preconditioning for 10 minutes at three regular intervals. Twenty-four hours post-preconditioning, both groups were subject to ischemia for 20 minutes, followed by 30 minutes of reperfusion. Oxygen extraction was higher in Group 1, the arterio-venous CO2 gradient was higher in the control group, but not significant. The lactate production was higher in Group 1. The second group had a higher Na+ and also a significant difference in K+ values. Receptor for Advanced Glycation End (RAGE) values were higher in the second group but with no significant difference (RAGE1=0.32 ng/mL versus RAGE2=0.40 ng/mL). The muscle samples from the control group displayed significant rhabdomyolysis, damage to the nucleus, while the preconditioned group showed almost normal morphological characteristics. The lungs and kidneys were most damaged in the control group, with damage expressed as thickened alveolar septa, neutrophil infiltrates, eosinophilic precipitates in the proximal convolute tubule. Ischemic preconditioning significantly attenuates the ischemic reperfusion injury. Endometriosis represents a chronic female genital tract disease characterized by implants outside the endometrial cavity, leading to alteration of pelvic anatomy and having as result chronic pelvic pain and infertility. Aim: From the molecular perspective, the aim of studying endometriosis is identifying a cause and a consequence, that lead to the appearance and perpetual arising of new implants. The description of the immunohistochemical (IHC) profile of ectopic endometrium could represent a new element in the pathogenesis of endometriosis and also a practical method to appreciate the aggressiveness and possibility of recurrence of the disease. The study consisting of histopathological and immunohistochemical (IHC) analysis of the tissues excised included 14 patients, operated from June to December 2014, to which was confirmed the presumptive diagnosis of endometriosis, based on anamnesis, clinical examination and ultrasound appearance. We identified the expression of estrogen and progesterone receptors, whose presence in the ectopic endometrium guides the medical hormone postoperative treatment. We also identified the expression of a cellular proliferation marker - Ki-67, and inhibition marker of cellular apoptosis - Bcl-2, in order to characterize the aggressiveness of endometriosis implantations and a stromal marker CD10. Although there are plenty of medical and surgical therapeutic methods available, the treatment of endometriosis must be individualized for every patient taking into consideration the IHC analysis. Consolidation of surgical treatment by prescription of a medical long-term treatment is indispensable, because endometriosis is a chronic relapsing disease. Our study aimed to investigate the quantitative profile of the renal corpuscle components in membranoproliferative glomerulinephritis (MPGN). We have analyzed digital color images corresponding to relevant microscopic fields from renal biopsies (10 cases type I MPGN and 10 cases type II MPGN). A computerized morphometric algorithm was designed and applied in both red-green-blue (RGB) and hue-lightness-saturation (HLS) color spaces, allowing the automated measurement of areas for the following morphological characteristics of the renal corpuscles (RCs): glomerulus, Bowman space, cells, mesangial matrix and glomerular basement membranes, and capillaries. Students t-test comparatively applied between the numerical data obtained for the measured morphological characteristics, for each individual color space, showed significant differences between type I MPGN and type II MPGN for Bowman space area (p=0.006) and for mesangial matrix and glomerular basement membranes area - exclusively in RGB color space (p=0.013). We have also demonstrated larger RCs and glomerular size in type II MPGN, comparative to those in type I MPGN. Consequently, we assume that the morphometrical characterization of RCs histological components could be used as an additional criterion not only in the diagnosis of MPGNs, but also in the stratification of evolution and prognosis of patients diagnosed with type I and II MNGN, respectively. Objective: The study aims to assess the both individual behavior and correlations of stromal fibrillary component (SFC) and vascular density (VD) in relation with Srigley architectural patterns of prostate carcinoma. Materials and Methods: Digital images of prostate adenocarcinoma labeled following both Gleason and Srigley systems were acquired with x20 objective from two serial sections, 340 from the section stained using Gomori technique for SFC assessment and another corresponding 340 from the section immunomarked with anti-CD34 antibody for assessment of VD. The SFC amount and VD were determined and compared. Srigley patterns were divided in two redefined behavioral groups: solid group (Srigley I, Srigley III, Srigley IV) and necrotizing group (Srigley II with subdivisions: Gleason 3A, 3C and 5A). Results: SFC mean values had an ascending trend in both solid and necrotizing groups. VD mean values had an ascending trend in solid group but a descending trend in necrotizing group towards Gleason 5A pattern. SFC and VD values had a direct, ascending correlation for all determinations (p=0.0006), but also for solid (p=0.005) and necrotizing (p=0.026) groups. The two stromal elements had different behaviors both individually and in their correlation that seem to be related with their interaction with different tumor cellular populations. Conclusions: Our results could plead for the hypothesis that the different subtypes of tumor architecture represent steps of a continuous process from well-differentiated status to poorly or undifferentiated status but who is accomplished by two different tumor cells populations with different distinct behavior in their relationship with the stromal microenvironment. Different animal models of experimental lung injury have been used to investigate mechanisms of lung injury. Lipopolysaccharide (LPS) administration is the most often used approach to model the consequences of bacterial sepsis. We created an endotoxemia rat model, simulating sepsis-related lung injury, in order to quantify the time and dose dependent severity lesions induced by the administration of lipopolysaccharide. Our study included 42 male Wistar rats, randomly divided into four groups: one control group (n=6) and three experimental groups (n=12/group) in whom we induced sepsis by intraperitoneal injection of progressively increasing doses of LPS (3, 5, 10 mg/kg). At six hours, the animals included in the groups with higher doses of LPS developed thrombocytopenia, elevated lactate levels, and liver and renal injury in a dose and time dependent manner. The severity of hypoxemia at six hours correlated with the increasing doses of LPS, with a slight improvement at 24 hours. Lung injury scores became more severe with increased dose and time of exposure to LPS without reaching the level of hyaline membranes formation. We also demonstrated translocation of a protein from the airspaces into plasma (RAGE - receptor for advanced glycation end products). Induction of sepsis using LPS is a known experimental model, but LPS treatment in rats does not cause the severe endothelial and epithelial injury that occurs in humans with acute respiratory distress syndrome (ARDS). In our study, the clinical, laboratory and histopathological findings confirmed sepsis and the damage of the alveolar-capillary membrane in a dose-dependent manner. The objective of this study was the tracing of the effect of Aspirin and Algocalmin, two of the most frequently used analgesics after the application of orthodontic appliances, on the dental displacements, starting from the hypothesis according to whom any substance that inhibits prostaglandins production will have as result the inhibition of the osteoclasts activity and of the orthodontic tooth movements implicit. Twenty-four male Wistar rats, separated into three groups were used. Group I (control) included eight rats in which the orthodontic device was applied, without a subsequent administration of any analgesic; Group II - eight rats in which after the device application Aspirin was administrated; and Group III - eight animals in which Algocalmin was administrated. A histological study was completed in order to establish the size of bone areola. Average mesial displacement of the first left inferior maxillary molar 28 days after applying the orthodontic device was of 3.61+/-0.29 mm for the control group. The average displacement in the group in which Aspirin was administrated was 0.03 mm. In the group treated with Algocalmin, the dental displacement was of 0.19+/-0.08 mm. Histological examination revealed the presence of large sizes bone areola in control group (244 micro-m), more reduced in the group treated with Aspirin (74 micro-m), and intermediate in that treated with Algocalmin (127 micro-m). Treatments with Aspirin and Algocalmin in experimental groups, immediately after the orthodontic device application, induced a decreased dental displacement rate. Aim: Gastric carcinoma shows considerable variation in the histological pattern and degree of differentiation. The aim of the study was to assess especially the morphological differences between gastric carcinomas revealing one morphological feature and those including two morphological features. Materials and Methods: Two groups of patients were selected: Group 1, including 43 patients with tumors revealing only one architectural pattern, and Group 2, including 16 patients with two architectural patterns within the tumor. In addition to gender and age, the main morphological parameters were: lesion location and macroscopic appearance on the surgical excision sample and microscopic appearance of the surgical excision sample, assessed for architectural pattern, secretory properties and prognosis based on histological features, degree of tumor extension and the degree of tumor aggressiveness, using a wide range of histological and immunohistochemical stainings. All data were compared between the two groups using statistical tests. Results and Discussion: Significant differences were observed between the values and distributions of morphological parameters in the two groups and were discussed comparatively. Conclusions: Tumors with two dominant histological aspects present simultaneously are a reality that cannot be argued but whose morphological and biological profile needs to be completed and validated. Ovarian cancer is still the leading cause of death from malignant genital tract lesions. Ovarian carcinomas represent about 90% of cancers that arise in the ovaries and are commonly diagnosed around menopausal age. This study examines different aspects of the heterogeneity of ovarian carcinomas and included 50 cases, 10 cases for each subtype. Our data showed that tumor types have distinct morphological and phenotypic patterns: high- and low-grade serous carcinoma, endometrioid, clear cell and mucinous carcinoma. The different subtypes of ovarian carcinomas have different molecular, pathological and clinical characteristics, the histological diversity of epithelial ovarian carcinoma mirroring thus distinct entities not just one disease. The research on Whartons jelly-derived mesenchymal stem cells (WJ-MSCs) from the umbilical cord suggests promising therapeutic use for hepatocyte replacement therapy. One of the highly conserved members of the nuclear receptor superfamily in the liver is hepatocyte nuclear factor-4alpha (HNF4alpha), involved in hepatocyte differentiation. The objectives of this study were to determine the effects of two- and three-dimensional (2D and 3D) cultures of WJ-MSCs on hepatocyte differentiation. MSCs were isolated from human Whartons jelly, characterized by flow cytometry, and differentiated toward osteogenic and adipogenic lineage. WJ-MSCs were cultured in 2D collagen films and 3D collagen scaffolds in the presence of hepatogenic media with or without pre-treatment with fibroblast growth factor-4 (FGF4) for 21 days. The expression of HNF4alpha was evaluated using quantitative real-time polymerase chain reaction (qRT-PCR). According to flow cytometry data, the cells isolated from Whartons jelly were shown to express MSC markers. HNF4alpha expression analysis revealed that pre-exposing the cells with FGF4 was more effective in hepatocyte differentiation. 3D cultures also improve the expression of HNF4alpha compared with 2D culture system. In conclusion, the combination of FGF4 and 3D culture improved hepatocyte differentiation. It seems 3D interaction of the cells improved the hepatogenesis. Electron microscopic investigations of invasive mammary carcinoma tumors revealed that intercellular junctions, namely desmosomes are severely altered; some desmosomes became internalized. Tumor cells, especially by their invadopodia, generate and disseminate membrane vesicles, including exosomes, inside of peritumoral stroma. Telocytes, a new described interstitial/stromal cell phenotype, considered to play important roles in cell signaling, exhibited a reduced number of hetero-cellular contacts, which suggests a possible perturbation of tissular homeostasis modulation. Signaling PIK3/Akt pathway plays an important role both in carcinogenesis and in proliferation, differentiation, and cell survival. Alteration of this pathway has been observed in many human cancers, often involving an increase in the activity of PIK3CA, p110alpha catalytic subunit of PI3K. Our study confirms the high prevalence of PIK3CA mutations in breast cancer. In accordance with the results of the largest previous studies, 87.5% of mutations detected by DNA direct sequencing were hot spot mutations, most of them located in the kinase domain. High percentage of mutations detected by high-resolution melting makes the assay an attractive choice for mutation scanning, especially, in samples with low percentage of tumor cell. The technical progress in the medical sector in the past decades has continuously driven the development of electrosurgical techniques. The controversies surrounding the superiority of a certain technique relative to another - electrocautery, laser and radiofrequency - have determined us to carry out a histopathological design with the aim of comparing the healing sort of the shallow wounds generated by the three types of electrosurgical devices. The experimental study has investigated the healing process inflicted by the electrosurgical devices mentioned beforehand on 12 Wistar albino rats. The wounds were inflicted under intravenous general anesthesia with Xylazine and Ketamine and were performed lateral to the spine region, using laser, radiofrequency and electric cautery. The histological samples harvested at one, three, five, and seven days were sent to pathological examination. We followed by comparison the evolution of the first two phases of the wound healing produced by the three electrosurgical methods analyzed. We described the histopathological changes occurred in the epidermis, dermis and hypodermis and also the subcutaneous soft tissues in all of the three types of lesions. Electrocautery remains the most frequently used electrosurgical device, even if it has unquestionable disadvantages as compared to other modern instruments. Laser-assisted surgery and radiofrequency are refine energy-based instrumentation, being utilized at a multidisciplinary surgical level. The balance between apoptosis and proliferation is tipped towards a decrease of apoptosis as the colonocyte progresses in the adenoma to carcinoma sequence of colon carcinogenesis. According to literature data, proteins like p53, Ki-67, APAF-1, Ets-1, PTEN contribute to inhibition of apoptosis and stimulation of proliferation. Aim: Considering the complex interference among colorectal carcinogenetic mechanisms, our aim was to study the markers Ets-1 and APAF-1 relative to p53, Ki-67 and PTEN expression in colon adenomas/polyps (A/P). 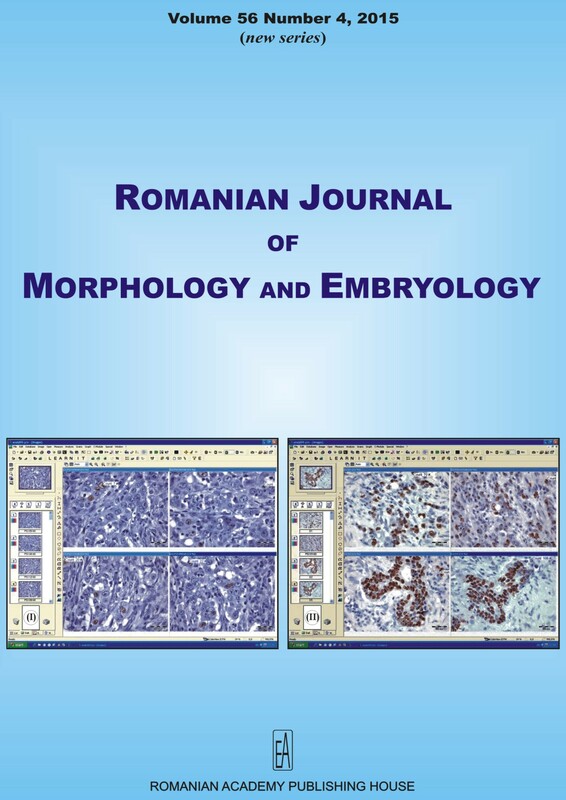 Materials and Methods: We performed immunohistochemistry on 99 colon A/P cases from the material of the Department of Pathology, Emergency County Hospital of Tirgu Mures, Romania. Secondary EnVision Flex/HRP (Horseradish peroxidase) (20 minutes) was used for signal amplification. Results: The majority of A/P show increased Ki-67, p53, Ets-1 expression, decreased APAF-1 expression and preserved PTEN expression. p53, Ki-67, Ets-1 and APAF-1 demonstrated statistically significant correlations with histological type and grade of dysplasia. We also observed that expression of these proteins in the intestinal crypts has a typical distribution according to histological type and grade of dysplasia. Conclusions: In case of hyperplastic polyps APAF-1 expression decreases as p53 and Ki-67 expression increases, followed by a decrease in PTEN expression in serrated adenomas, and an increase of Ets-1 expression in conventional adenomas. Phyllodes tumors are rare breast tumors, accounting for less than 1% of all primary tumors of the breast. Histologically, phyllodes tumors can be divided into benign (60%), borderline (20%) and malignant (20%). The mammography examination was performed by means of a digital mammography system Giotto 3D Images; the ultrasound examination was performed through a GE Logiq P6 device and histological confirmation was possible after surgery or following the histological biopsy. We grouped the nine patients who presented clinically palpable nodules into two groups, namely: the six patients presenting histological benign results into Group I, and Group II where we included those with borderline and malignant histological results. Mammography performed in 77.7% revealed a well-circumscribed round or oval opacity or with contour lobules. Ultrasound examination was performed in all patients. Mammography and ultrasound have limitation in differentiating between benign lesion and phyllodes tumor. In the nine analyzed cases, mammographic and ultrasound examinations did not allow the differentiation into the three groups of phyllodes tumor. Histopathological examination is considered the golden standard for their diagnosis. Correlations between mammographic and microscopic aspects were inconclusive for determining the degree of differentiation, ultrasound changes could be correlated with the histopathological aspects. A sample of 250 kidneys (200 corrosion casts and 50 dissection pieces) provided the basis for the analysis of the number, source, origin point and parenchymal penetration of the arterial branches supplying the two renal poles. Of the studied pieces, 76.80% had a single renal artery, while 23.20% had multiple renal arteries. The superior pole had only one arterial source in 95.20% of cases, and the inferior pole had only one arterial source in 97.20% of cases. The arteries supplying the superior pole originated from one of the renal arterys branches in 59.60% of cases and from its main trunk in 17.20% of cases. They were also found to originate from branches of the multiple renal arteries in 18% of cases and from the abdominal aorta (5.20% of cases - inferior polar arteries). The arteries supplying the inferior pole arose in similar fashion - from the single renal arterys trunk in 9.20% of cases; from its division branches in 66.40% of cases; from the abdominal aorta in 9.60% of cases and from branches of multiple renal arteries in 14.80% of cases. Familiarity with the renal arteries morphological variability is becoming increasingly important, as new urologic surgical and radiological techniques develop. The aim of the study was to conduct a histological evaluation of gingival condition in patients under orthodontic treatment with fixed appliances, according to different oral hygiene maintenance programs. We performed a randomized prospective study on 36 patients with fixed orthodontic appliances (17-25 years of age) divided in three study groups. The investigations were represented by measurements of plaque index and sulcular bleeding index, followed by pathological examination of specimens from gingival tissue. Treatment of orthodontic patients must follow an interdisciplinary approach. All modalities of oral hygiene procedures and their effect on the periodontal tissues must be explained to the patient prior to fixed orthodontic treatment. Fixed orthodontics do not induce periodontal disease if basic principles of oral hygiene are followed in compliant patients, which are correctly instructed to deal with real challenge, represented by complete elimination of debris and bacterial accumulation. Gentamicin is an aminoglycoside antibiotic with a wide spectrum of anti-bacterial activity, but however, due to its high solubility in water, it poorly penetrates inside the cells. This major inconvenient constitutes an important challenge for the treatment of intracellular bacterial infections, which might be solved using appropriate delivery systems for the targeted release of the bioactive agents at the intracellular sites of infection. Thus, in the case of antibiotics, the use drug delivery systems may contribute to increase their therapeutic activity against intracellular pathogens. This paper presents an efficient polymeric delivery system for the intracellular release of gentamicin based on bacterial polysaccharides. Rapid diagnosis of malignancy during oncological surgery is crucial for making decisions related to the extension of the resection. The tissue prints, used initially for plant biology but also for prostate or breast cancer diagnosis, might be useful as a rapid cytological diagnosis. Materials and Methods: Tissue prints were done from freshly sectioned excised tissue fragments in patients operated between March 2010 and February 2012 in the Department of Surgery for cancer or benign lesions. Tissue prints were examined by a cytologist and considered as malignant or benign. Same fragments were then processed in the pathology laboratory using the typical paraffin-embedding method. All slides were examined by the same pathologist and considered the golden standard for malignancy and histological type. Results: Three hundred and eleven fragments were examined, obtained from lung masses, lymph nodes, pleura and mediastinal masses, pathology showed 208 malignant and 103 benign. Tissue prints identified 227 malignant and 84 benign. For identifying malignancy, tissue prints had a sensibility of 0.91, specificity 0.64. Positive predictive value was 0.86 and negative predictive value 0.78. For lymph nodes, the specificity was better. In lymphomas and adenocarcinomas, tissue prints identified also the histology type in most cases. Conclusions: Tissue prints are rapid, easy to perform, cheap, with high sensibility but specificity lower than literature data on frozen sections. This might be improved by a better selection of cases where tissue prints are used for rapid diagnosis. Salivary gland tumors are rare neoplasias with approximately 34 different histological types. Because they have a considerably histological and biological behavior variability, salivary gland tumors represent a challenge both for the pathologist and the surgeon regarding their diagnosis, prognosis and treatment. Evaluation of mitotic index in case of Ki-67 and p53 expression has proved to be useful in predicting the biological aggressiveness in many tumors. In this study, we have analyzed the p53 and Ki-67 immunohistochemical expressions in 40 cases of salivary gland tumors, their correlations with clinicopathological factors and the prognostic relevance and diagnostic value of the results obtained. We analyzed eight pleomorphic adenomas (PA), seven Warthin tumors (WT), five basal cell adenomas (BA), four carcinomas ex pleomorphic adenoma (CEPA), four mucoepidermoid carcinomas (MEC), four acinic cell carcinomas (AC), four adenoid cystic carcinomas (ACC) and four adenocarcinomas not otherwise specified (ADK NOS). p53 positive staining was detected in 18 of the 40 cases studied, with higher expression in the malignant salivary tumors investigated. Ki-67 was expressed in 29 cases. High p53 and Ki-67 expression was noted in 3/4 CEPA, 3/4 ADK NOS and 2/4 MEC. Also, 2/8 PA, 3/7 WT and 2/5 BA were p53 positive and 2/7 WT and 2/5 BA had high Ki-67 mitotic index. The investigation of p53 and Ki-67 expression is useful in identifying highly proliferative forms of salivary tumors, with aggressive potential of evolution. The evaluation of these proliferative markers seems to have a prognostic value for CEPA, ADK NOS and MEC types of salivary tumors. Introduction: Cyclooxygenase-2 (Cox-2) and matrix metalloproteinase-9 (MMP-9) have synergistic effects in the degradation of the extra-cellular matrix. Objective: The aim of our study was to correlate the intensity of inflammation with MMP-9 and Cox-2 expression in the periodontal tissue of patients with chronic inflammatory disease (gingivitis and chronic periodontitis) in order to determine the role of these two biomarkers in the progression of periodontal disease. Materials and Methods: To conduct this study we analyzed the gingival biopsies taken from patients clinically divided into three study groups: Group I (control): Patients free of periodontal disease (seven biopsies); Group II: Patients with gingivitis (10 biopsies); Group III: Patients with chronic periodontitis (10 biopsies). In these three groups, we graded the intensity of inflammation in the lamina propria and the immunohistochemical expression of MMP-9 and Cox-2. Results: The presence of a large number of inflammatory cells in the lamina propria in patients with gingivitis or chronic periodontitis (Groups II and III) correlated with the clinically diagnosed inflammation of the gingival tissue. The expression of MMP-9 was higher in patients with chronic periodontitis than in those with gingivitis, showing a trend towards statistical significance (p=0.07, Mann-Whitney U-test). The expression of Cox-2 in periodontitis was also higher compared to gingivitis (p=0.05, Mann-Whitney U-test) and to controls (p=0.001, Mann-Whitney U-test).The inflammation score could be positively correlated to the MMP-9 and Cox-2 expression scores at the overall study group, but not separately on gingivitis and periodontitis patients. Conclusions: The presence of an intensive inflammatory infiltrate is characteristic both for periodontitis and gingivitis. MMP-9 and Cox-2 show higher expression in periodontitis, than in gingivitis and healthy controls, but MMP-9 and Cox-2 expression scores cannot be directly correlated to the grade of inflammatory infiltrate in the two different disease entities. As biomarkers of chronic inflammation activity, angiogenesis, and degradation of the extracellular matrix, MMP-9 and Cox-2 can be used in clinical practice for the detection of patients with chronic periodontitis risk, at whom treatment with Cox-2 and MMP-9 inhibitors may be considered. Aseptic osteonecrosis causes various clinical manifestations, depending on its location, but has in common a histopathological and radiological substrate. Aseptic osteonecrosis of the femoral head is a condition whose pathogenesis remains unclear despite many theories developed so far, and the discovery of numerous risk factors. The objective of this study is to emphasize the role of imaging techniques and correlating histology and immunohistochemistry methods in order to more accurately stage the disease. This retrospective study was performed on a total of 103 patients with clinical and radiological suspicion of unilateral or bilateral osteonecrosis. For the diagnosis criteria, we used clinical information, pelvic X-ray images, magnetic resonance imaging (MRI) or computed tomography (CT). For the inclusion of patients in a disease stage, we used the Association Research Circulation Osseous (ARCO) classification system. For patients diagnosed at an advanced stage, who underwent hip arthroplasty, we harvested biological material necessary for the histopathological study. There were differences in the appearance and extent of the lesion on the histological samples compared to macroscopic examination and even those obtained through imaging means, particularly for patients in evolutionary stage III. Aspects such as the extension of the area of fibrosis, bone tissue remodeling, the density of the newly formed vascular network and degree of impairment of the cartilage, are determined more accurately using histology and immunohistochemistry techniques. Before classifying patients in a certain stage, after correlating clinical and imaging data, histopathological aspects have to be considered, particularly in patients in stages III and IV, in which total hip arthroplasty could be delayed. The investigation of desired optimal interface between bone and dental or orthopedic implants, and whether a newly developed material conforms to the requirements of biocompatibility and mechanical stability, are important and rigorous procedures as an essential step prior to clinical trials. The present study proposes the investigation of a novel ceramic implant in terms of biocompatibility, osseointegration and bone response, by an experimental study using a small animal model (rabbit). Radiological examination after six weeks post-surgery highlighted the stability and well integration of the implant, without fibrous tissue or other undesirable complications. The histological analyses highlighted the morphological details of the new tissue, which was well vascularized throughout its thickness. The new bone formation ensured not only the coverage of the implant hole, but also the continuity with the adjacent bone. The chemical stability is suggested by the XRD (X-rays diffraction) pattern, as the implant did not showed erosion marks at the surface, not even discrete ones. Moreover, the XRD pattern recorded on the surface of femoral bone showed the fingerprints of hydroxyapatite indicating that the new bone covered the surface of the implanted area. The qualitative and quantitative aspects of the new bone were highlighted through light microscopy and SEM/EDX (scanning electron microscopy/energy dispersive X-rays), especially the lamellar architecture of the new bone at the contact area with the implant, six weeks after insertion. The Ca/P ratio was evaluated, which is a valuable indicator in qualitative assessment of the osseous tissue. Hepatocellular carcinoma (HCC) represents a major health burden, as curative methods only apply to a select small portion of the affected population. Screening programs are ineffective in the absence of established underlying conditions such as viral hepatitis or alcohol abuse resulting in liver cirrhosis. Thus, overweight or obese, diabetic patients as well as non-alcoholic fatty liver disease (NAFLD) cases are often overlooked as potential candidates for HCC development. Current diagnostic methods for HCC are restricted to non-invasive imaging tests; however, the need for accurate predictive or therapeutic markers make histological studies a necessity; the latest guidelines and recommendations demand an increased effort in obtaining pertinent data from immunohistochemical investigations. Our aim was to retrospectively evaluate a series of patients with common symptoms and manifestations of metabolic syndrome who underwent liver biopsy after imaging revealed suspicious liver masses. We describe the major findings of both common histological evaluation and microvessel density evaluated by positive CD34 immunostaining. The use of dermatoscopy increases melanocytic nevi diagnostic accuracy, and is important for dermoscopic monitoring of atypical lesions, allowing to find significant changes in the earliest stage. Dermoscopic diagnosis of melanocytic nevi type in a group of patients and their follow-up with the assessment of changes occurred during dermoscopic monitoring. Dermoscopically, we followed the nevic size and pattern, the color and pigment distribution. Follow-up visits were scheduled depending on the type of the melanocytic lesions and the patients compliance. The nevi that have shown significant dermoscopic changes were excised and histopathologically examined. The study was performed on a group of 92 patients, mostly females (56.5%), mean age of 29.1 years. Of the total of 1544 melanocytic nevi examined, 27.4% were atypical and 72.6% common nevi. The average dermoscopic examination interval was 14.1 months. During monitoring, 35.5% atypical nevi and 22.5% common nevi have modified, especially changes in pigmentation and color (31% atypical nevi and 9.9% common nevi) and the appearance of new dermoscopic structures (12.7% atypical nevi and common nevi 8.5%). Of the total nevi monitored, 3% showed significant changes and were excised and examined pathologically, without diagnose of any malignant transformation. In our study, dermoscopic changes appeared in atypical as well as in common nevi. The dermoscopic monitoring of melanocytic-pigmented lesions remains an accessible method of assessment the evolution of nevi and can reduce the risk of appearance of malignant melanoma in the general population. Background and Aim: The process of myocardial fibrosis is based on the remodeling of the extracellular matrix (ECM), which leads to increased myocardium stiffness and, in turn, severe alterations of the cardiac function. This phenomenon is consecutive to various types of cardiac disease, primarily infarction, due to inflammatory reactions involving various types of cellular mechanisms. We aimed in this paper to assess both microscopically and immunohistochemically the main aspects of ischemic myocardium found in areas of fibrosis and compare the findings with normal images from unaffected cardiac tissue of the same type. Materials and Methods: Our study included infarction fragments of 2/2/2 cm harvested after autopsy from 26 patients who died during 2014 at the Emergency County Hospital of Craiova, Romania, following the diagnostic of ischemic cardiomyopathy. After usual histological preparations, we performed both classical staining with Hematoxylin-Eosin and trichromic Goldner-Szekely, as well as immunohistochemical assessment using anti-alpha-SMA, anti-desmin, anti-CD34 and anti-CD68 antibodies. Results: We have evaluated myocardial fibrosis in all areas of the myocardium and noted that it primarily develops around the arterioles and metarterioles. The area of myocardial fibrosis was more extensive, myocardiocytes being surrounded by collagen fibers. Collagen interstitial fibrosis, gave a brindle look to the myocardium. Myocardial fibrosis areas did not reveal myofibroblasts. We found lower numbers of blood vessels with an uneven distribution in areas of myocardial fibrosis. In the areas of normal myocardium, the macrophage numbers were two to three times lower than in areas of fibrosis, also displaying larger volume, with intense reaction to CD68. Conclusions: Myocardial interstitial fibrosis occurs in outbreaks, mainly perivascular, but it affects larger areas of the myocardium interstitial space. We believe that interstitial fibrosis is a progressive process that can become permanent, thus constituting a promising therapeutic target for a large variety of cardiac conditions. Background: Due to their unique behaviors, carbon nanotubes (CNTs)-based systems meet essential requirements for modern applications, such as electronics, optics, photovoltaics, fuel cells, aerospace engineering, military and biomedical applications. CNTs biocompatibility and toxic effects were assessed both in vitro and in vivo, in terms of hemocompatibility, cytocompatibility, immunoreactions and genetic behavior. Aim: The aim of this paper is to evaluate the in vivo biodistribution and biocompatibility of carbon nanopowder synthesized by plasma processing, using a BALB/c mouse experimental model. Materials and Methods: Three months old BALB/c mice were aseptically injected with 100 micro-L of 1 mg/mL dispersions. The obtained carbon-based nano-systems were dispersed in saline solution and subsequently sterilized by using a 30 minutes treatment with UV irradiation. The reference mice were injected with 100 micro-L of saline. The mice were kept under standard conditions of light, temperature, humidity, food and water (ad libitum) before the vital organ harvest. The animal welfare was daily monitored. At two and 10 days after the inoculation, the animals were euthanized under general anesthesia, for the sampling of internal organs (brain, myocardium, pancreas, liver, lung, kidney and spleen). Results: No animal died during the experiment. Brain, myocardium and pancreas were histologically normal, with no tissue damage, inflammatory infiltrate or inorganic deposits. CNTs were evidenced only in hepatic, renal, pulmonary and spleen tissue samples. Increased amounts of inorganic granular structures were reported after 10 days of treatment, when compared to the short-term (two days) inoculation. Conclusions: Our BALB/c mouse experimental model was found to be useful for the in vivo assessment of biodistribution and biocompatibility of CNTs. Pancreatic neuroendocrine tumors are a rare subset of pancreatic neoplasms. We report the case of a 33-year-old female patient who was admitted to the Diabetes Clinic of Craiova, Romania, due to a two-year history of episodic neuroglycopenic hyperinsulinemic hypoglycemic symptoms, suggestive for insulinoma associated with facial and upper trunk flushing characteristic to carcinoid syndrome. During these episodes, the laboratory investigations showed hypoglycemia (38 mg/dL), hyperinsulinemia (54.72 micro-U/mL) and normal values of beta-hydroxybutyrate, chromogranin A, serotonin, anti-insulin antibodies and urinary levels of 5-hydroxyindoleacetic acid. Endoscopic ultrasound with SonoVue and 3T MRI revealed an 18.3/16.3 mm hypervascular tissular mass situated in the uncinate process of the pancreatic head in close contact with the superior mesenteric vein without invasion and no other detectable secondary lesions in the pancreas or any other abdominal viscera. Patient underwent enucleation of pancreatic tumor. The histological and immunohistochemical findings indicated a functional well-differentiated pancreatic neuroendocrine tumor, G1 category according to the World Health Organization (WHO) criteria, with uncertain behavior (Ki67 index was 3%), confined to the pancreas, but with tumoral invasion of the delimiting conjunctive capsule. No evidence of tumoral CK19 staining, mitoses and necrosis, angioinvasion or extra-pancreatic invasion was observed. A post-operative nine-month follow-up showed resolution of hypoglycemic symptoms, normalized blood glucose and insulin levels and no evidence of recurrence. Our case report highlights the pitfalls in diagnosing a functional pancreatic neuroendocrine tumor due to atypical symptoms, the difficulty of identification and precise location of the small-size tumor and uncertain histopathological and immunohistochemical behavior. Gastrointestinal stromal tumors (GISTs) are rare but challenging tumors regarding the diagnosis and therapy. The symptomatology depends on the tumor size and location, and can be totally non-specific, as in the present case. We present the case of a 76-year-old female that was hospitalized with postprandial nausea and vomiting. Bulging of the posterior wall of the stomach was seen at endoscopically examination and confirmed by the computed tomography. Surgical resection of the 120x100 mm-sized tumor that involved the posterior gastric wall and gastrocolic ligament, was performed; the posterior wall of the stomach was also partially excised. Histological examination revealed a 120x95x70 mm nodular tumor with solid aspect and large necrotic and hemorrhagic area on cut section. The tumor cells were marked by c-KIT, DOG-1, smooth muscle actin and MSH-2 and were negative for Ki67, maspin, E-cadherin, S-100, and keratin AE1/AE3. The resection margins were free of tumor cells. No recurrences were reported three years after surgical intervention; no postoperative chemotherapy was performed. This case highlights that a well-conducted trans-disciplinary approach can have real benefits, even in borderline-operable giant potentially-malignant GISTs. New criteria to establish the malignant potential of GIST should be explored. We report an atypical case of a 53-year-old male with the presence of six renal arteries (RAs) (bilateral triple) found incidentally on multi-detector computed tomography (MDCT) angiography, which was used to investigate peripheral vascular disease of the lower limbs. The distance between the extreme points of RAs origin from abdominal aorta (AA) was in right 4.42 cm, and in left 2.40 cm. The distance between the extreme points of penetration into the renal parenchyma was in right 2.01 cm, and in left 2.56 cm. On each side, the endoluminal diameter at the origin of the main RA (in right 0.54 cm, and in left 0.42 cm) was significantly larger in comparison with the other additional renal arteries (AdRAs) (in right 0.21-0.29 cm, in left 0.24-0.35 cm); however, the AdRAs were much longer (in right 7.42-10.82 cm, in left 5.90-6.85 cm) than the main RA (in right 6.21 cm, in left 5.73 cm). All the four AdRAs were hilar RAs. Knowledge of this anatomical variation should not be ignoring when planning the adequate interventional radiological and surgical procedure. Malignant melanoma of the larynx is a rare cancer that can appear as a primary tumor or as a metastasis from a cutaneous head and neck primary lesion. We present a new case of primary laryngeal malignant melanoma diagnosed by histological examination of an excisional biopsy specimen. The patient was a 53-year-old man with a history of smoking and hoarseness but without any clinical evidence of other cutaneous malignant melanocytic lesions. Microscopically, the tumor consisted of polygonal-epithelioid cells admixed with more elongated, spindle-shaped cells. Some of the tumoral cells demonstrated dark brown cytoplasmic and nuclear melanin. Despite significant ulceration and disruption of the epithelium, in situ malignant melanocytes were recognized within the remaining epithelium. Immunohistochemical stains were strongly positive for S-100 protein, HMB-45 and Melan-A. On the other hand, cytokeratin stains were negative. Based on the clinical and histological findings, a diagnosis of primary malignant melanoma of the larynx was established. Retroperitoneal ancient schwannomas are rare tumors, more usually found in the head, neck and flexor surfaces of the extremities. Ancient schwannomas are a subtype of classic schwannomas with a predominance of degenerative changes, calcifications, hemosiderin deposition, interstitial fibrosis and vascular hyaline degeneration. A 33-year-old male was referred on our hospital with a painful mass in left iliac fossa. The patient underwent surgery and intra-operatively the cystic encapsulated mass was found to be retroperitoneal, between the left psoas major muscle and left iliac muscle. On microscopic examination, we found the presence of Schwann cells in regions with high and low cellularity (Antoni A and B areas) and S100 protein immunohistochemical examination was intensely positive, being consistent with the diagnosis of schwannoma. Complete excision is the only method of the surgical treatment; schwannomas are not sensitive to radiotherapy and chemotherapy. Some authors consider that a complete excision of the tumor, while others believe that enucleated or partial excision of the tumor is sufficient. The prognosis is good, and the most common complication is recurrence, possibly by incomplete excision of it being reported in 5-10% of cases. In conclusion, retroperitoneal schwannomas is usually identified incidentally on tomographic images. Diagnosis is based on histopathological examination after surgery and immunohistochemical examination. Here we present a systematic approach to histopathological reporting of high-grade myxofibrosarcoma of 66-year-old male patient. The tumor was biopsied with fine-needle aspiration (FNA) and core-needle biopsy (CNB) and then the whole myxoid tumor was excised with left musculus gluteus maximus. The lesion was stained with Hematoxylin-Eosin (HE), Periodic acid-Schiff (PAS), Alcian blue, Massons trichrome, Ki67, alpha-smooth muscle actin (alpha-SMA), S100, CD34 and vimentin. FNA material grounded the diagnosis of non-epithelial neoplasia, while CNB was enough to produce diagnosis of myxoid sarcoma. The tumor lied under superficial fascia with no extension beyond deep fascia or any invasion of skin, vessels or nerves, either. The tumor was intramuscular, mainly myxoid with hypercellular areas of highly atypical cells with bizarre giant multinucleated cells that clearly belonged to category of high-grade sarcoma. According to Federation Nationale des Centres de Lutte Contre le Cancer (FNCLCC), the case was assessed for 5 points. Ki67 index reached more than 80% malignant cells. Alcian blue was strongly positive in myxoid background. Massons trichrome emphasized fibrillary structure of tumor. Negativity for S100, alpha-SMA with strong co-expression of CD34 and vimentin supported the diagnosis of myxofibrosarcoma. The lesion was diagnosed as high-grade myxo-fibrosarcoma (formerly myxoid malignant fibrous histiocytoma) G2 pT2b [7th edition pTNM (pathological tumor-node-metastasis), code ICD-O 8811/3 in World Health Organization (WHO) Classification 2013]. In approach to diagnosis of soft tissue malignancies, a strict sequence of procedures should be applied as only meticulous and ordered diagnostic pathway would succeed in and correct identification of a peculiar type of sarcoma. Borderline ovarian serous tumors are a rare distinct category of epithelial ovarian tumors, distinguished from both benign and invasive ovarian tumors. As borderline ovarian cysts are only a small part of the gynecological conditions of children, the therapeutic approach to this special type of tumor has not been standardized yet. Despite the technological breakthroughs that we have witnessed lately, the positive diagnosis of ovarian tumors is possible only by surgery and histopathological examination, and laparoscopic surgery has become the golden standard in the management of this condition. The aim of this case report is to demonstrate a very good long-term evolution after minimal invasive treatment and minimal damage to the reproductive apparatus in children with borderline ovarian tumors. The case reported in this paper is that of a 17-year-old adolescent with borderline serous papilliferous cystadenoma diagnosed by ultrasound and computed tomography (CT) scanning, whose CA-125 biomarker had normal values. As the purpose was to preserve the patients reproductive function, we chose to remove and excise the cyst by laparoscopic surgery, without removing the ovaries. The patients subsequent evolution was positive and at 19-year-old, she gave natural birth to a healthy baby girl. Nevertheless, as relapses are possible after many years, the patients long-term monitoring is necessary. We report a case of CMV (cytomegalovirus) infection in a Crohns disease patient, resulting in severe hemophagocytic syndrome and death. A 63-year-old man with a 10-year history of ileal and colonic Crohns disease presented with general malaise, loss of appetite and weight loss over the last month. He was in clinical remission for two years, with maintenance therapy 5-Aminosalicylic acid (5-ASA)-derived Mesalamine. The patient had no prior immunomodulators or suppressive treatment. A colonoscopy was performed and we found appearance suggestive of active Crohns disease, confirmed by histopathological examination. A diagnosis of an exacerbation of Crohns disease was established. Although the specific treatment was initiated, patients general condition degraded progressively and diarrheal stools appeared, followed by an episode of massive gastrointestinal bleeding - hematochezia. We performed a new colonoscopy and the pathological examination revealed Crohns ileocolitis with superimposed CMV infection. Despite the initiation of Ganciclovir alongside with other intensive care measures, he increasingly deteriorated and chest X-ray confirmed multilobar pneumonia. The occurrence of rapidly progressing pancytopenia and evidence for disseminated intravascular coagulopathy as well as hyperferritinemia, raised the suspicion of hemophagocytic syndrome confirmed by bone marrow aspiration. Hence, CMV-associated hemophagocytic syndrome in the context of recent corticotherapy for Crohns disease was established. There is enough evidence that supports the gravity of the CMV infection in the case of inflammatory bowel disease (IBD) patients, especially the ones on immunomodulator treatment. The hemophagocytic syndrome reactively occurs in patients with infections in cases of immunodeficiency, displaying a hematological aspect of multiple organ dysfunction syndrome. T-cell lymphoblastic lymphoma is an aggressive malignancy that represents 85% of all lymphoblastic lymphomas. It usually occurs in late childhood, adolescence and young adulthood with a 2:1 male preponderance and it presents with pleural effusion and respiratory symptoms and in rare cases vena cava syndrome can be encountered. We present the case of a 13-year-old patient who was referred to our clinic from a local hospital where he was diagnosed with a mediastinal tumor. The patient presented with thoracic pain, fever, coughing and fatigability for a month prior to admission, after having underwent surgery for abdominal pain (appendectomy). On admission to our hospital, a thoracic computed tomography (CT) scan was performed and showed the presence of an anterior mediastinal mass measuring 109/76/140 mm, well defined, which came in close contact with the superior vena cava, the ascending aorta and the pulmonary artery, right pleural effusion and a collapsed lung on the right side. The decision was taken to perform a tumor biopsy and a right pleural drain was placed. The patients post-operative evolution was favorable with the remission of the respiratory symptoms. The histopathological result showed the presence of T-cell lymphoblastic lymphoma and the patient was then transferred to the oncology ward where he underwent chemotherapeutic treatment, with a favorable outcome. T-cell lymphoblastic lymphoma is an aggressive type of lymphoma and it is usually hard to diagnose considering the fact that the symptoms are often vague. It is essential to establish the diagnosis without delay and start appropriate chemotherapeutic treatment. Teofil Simchowicz (1879-1957) was a Polish-Jewish neurologist who studied medicine at the Warsaw University, and worked under the founder of modern Polish school of neurology, Edward Flatau (1868-1932). It was Flatau who encouraged him to join Alois Alzheimer (1864-1915) in Munich. Simchowicz focused his research on the neuropathological changes in dementia. He emigrated with his wife to Palestine, where he continued to work as a consulting neurologist. Simchowicz coined the terms senile plaques, senile index, and granulovacuolar degeneration - discovered in the hippocampus in patients with Alzheimers disease, and described the nasomental reflex. Simchowicz was a prolific researcher in the field of neuropathology, especially neurodegeneration but also in clinical neurology. One of the personalities who marked in a positive way the evolution of Romanian histology was Ioan Dragoiu (1873-1941). Unfortunately, after nearly three quarters of a century after his death his name is not sufficiently known, both in Cluj (where he had the most significant part of his career), as well as in whole Romania. He was the first full professor of histology who devoted himself to the Romanian Faculty of Medicine from Cluj, where he worked from 1924 until 1941. During this period, he created a school of histology, among his disciples being Cornel Crisan (1895-1958) and Iosif Mihalca (1906-1981). The most important achievement of Dragoiu was his complete histology textbook, which was a premiere in the Romanian scientific literature. The title is Histological Elements and Microscopic Techniques (1931-1933). Our paper presents the opening lecture of histology, held by Dragoiu on January 19, 1925 at the Faculty of Medicine from Cluj. Although this lecture is neglected, it represents a very significant document in which Dragoiu gave arguments concerning the role of histology in the curricula of medical faculties. It also reveals his conception about the usefulness of correlating the notions of histology with those of physiology. A special part of this lecture was focused on the presentation of the majority of the most important masters of histology from the past.